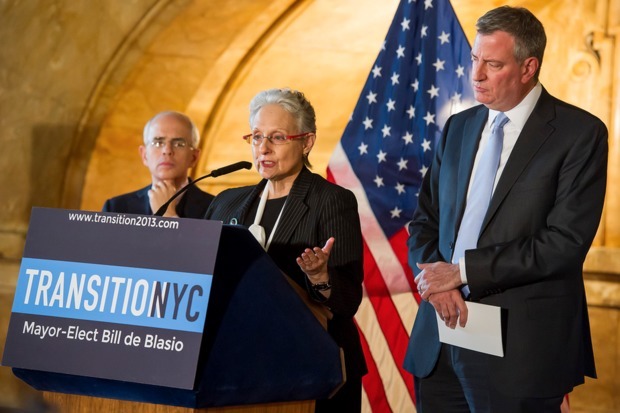 Mayor Bill de Blasio's Deputy Mayor for Health and Human Services Lilliam Barrios-Paoli will leave her post at the end of the month to take an unpaid position as chair of the board of the Health and Hospitals Corporation, the administration announced Monday evening. NEW YORK CITY — Mayor Bill de Blasio's deputy mayor in charge of homeless services, Lilliam Barrios-Paoli, will leave her post at the end of the month to take an unpaid position as chair of the board of the Health and Hospitals Corporation, the administration announced Monday evening. Barrios-Paoli, the Deputy Mayor for Health and Human Services, is one of the highest-ranking Latino officials in the de Blasio administration. She is also the highest-ranking official to resign during de Blasio's 20 month tenure. Her departure comes as the mayor is facing criticism about both the levels of homelessness in the city and from some Latino leaders over the diversity of top officials in his administration. The mayor described Barrios-Paoli's "devotion to social services" as "unparalleled" and praised the work she had done in his statement about her departure. "She oversaw the implementation of new social programs that are improving the lives of thousands of New Yorkers, including the development of rental assistance programs for the homeless, an unprecedented training institute for child welfare workers, an ambitious plan to expand community health care, and helped with the historic expansion of after-school programs," de Blasio said in the statement. Barrios-Paoli said she was "honored" to have served under de Blasio. Speaking on the Brian Lehrer Show on WNYC Tuesday, de Blasio once again praised Barrios-Paoli. Asked by Lehrer to explain why no reason was given for Barrios-Paoli's resignation, de Blasio said that she made a "personal decision" to resign. "Everyone has to make their own choices about how long they want to be in public service in this vein," said the mayor. Under de Blasio, the homeless shelter population jumped to 59,000 in December from 53,000 at the end of former Mayor Michael Bloomberg's term. The number of 311 calls regarding the homeless has jumped 60 percent since de Blasio took office. Advocates and city officials say they inherited the problem from Bloomberg who was criticized for cutting rental assistance programs that helped keep people in their homes. De Blasio called that decision by his predecessor a "huge policy mistake" on WNYC. The mayor has also blamed media coverage that is not "proportionate" to the problem for the increase in 311 calls about the homeless. "There is both a perception and a reality problem," de Blasio said about homelessness on WNYC. He blamed the economy and housing costs for making homelessness a structural issue. The number of homeless in shelters has dropped to 56,000, and the administration announced it will spend an additional $1 billion over the next four years to address the problem. The city also announced a $22 million initiative to address the mentally ill who are prone to violence that includes additional resources for the city's Department of Homeless Services. Social services advocates were surprised by Barrios-Paoli's departure. "The deputy mayor was an absolute champion for human services even before she was appointed because of her long history in government," said Christy Parque, executive director of Homeless Services United. "The whole community was so ecstatic when she got appointed because she understands the issue and was ready to take action." Barrios-Paoli's resignation is also raising eyebrows in the Latino community, said Javier Nieves, chairman of the Campaign for Fair Latino Representation. The group has been critical of the number of Latino officials that de Blasio has hired, saying that only about 12 percent of announced appointments were Latino even though the population makes up a third of the city. The news of Barrios-Paoli's resignation comes shortly after word that another high-ranking Latina, Film Commissioner Cynthia Lopez, announced her resignation and is leaving in October. "We are very disheartened by what's taking place. Now it's not just about appointing more Latinos, but that Latinos are leaving his administration," Nieves said. "To see these two high-ranking Latino women in his administration resign lowers that number and it raises a lot of questions about what is happening internally." According to a recent Quinnipiac University poll, 48 percent of Latino voters approve of the way de Blasio is handling his job, down from 54 percent in January. "People are dissatisfied in the Latino community," said Nieves. "I don't know who is advising him on how to deal with our community but there is a problem."